Fox's Prison Break wrapped its second season Monday night with pretty boy brother Michael Scofield (Wentworth Miller) re-jailed in what looks to be a very stinkin' Panama City hellhole. Now it will be up to older brother Lincoln Burrows (Dominic Purcell) to help spring him after Michael turned that trick at the end of Season 1. Oh the irony. And oh the head-hurt from too many far-fetched plot twists. Still, lots of area people benefited from the show's presence in North Texas for the entire second season. And PB again is set to make Dallas its home base for Season 3, although some filming will be done in Louisiana and Florida. Two of Scofield's nemeses, FBI agent Alex Mahone (William Fichtner) and brutish prison guard Brad Bellick (Wade Williams), find themselves in the same filthy Panama City cell block. Please don't ask for an explanation. Just know that Season 2 ended with Scofield warily checking out his new surroundings while various scumbags checked him out. This looks like an infinitely nastier place than the old Fox River Pen, but you can only go so far with this stuff before the show's remaining viewers get totally turned off. As has been noted here many times, PB has not done well in the D-FW ratings, even though the series is filmed here. In fact, a third season wouldn't be an option if the ratings were as low nationally as they are here. That doesn't mean they're great in the country at large, but a 38th place ranking with advertiser-craved 18-to-49-year-olds proved to be just good enough to make the cut. The show in turn cut costs along the way, killing off a wide variety of regulars and recurring characters. Crook-turned-good guy Paul Kellerman (Paul Adelstein) went down in a hail of bullets Monday night while badly wounded former inmate Fernando Sucre (Amaury Nolasco) was left for dead. Adelstein will be just fine. The actor already has signed to co-star in ABC's Grey's Anatomy spinoff series. Another PB character, David "Tweener" Apolskis (Lane Garrison), got executed by FBI agent Mahone in the first half of the season. Real-life tragedy then hit the Dallas native hard. He was charged with felony vehicular manslaughter in early March in connection with a fatal car crash in Beverly Hills that claimed the life of one of his three teenage passengers. Garrison, 26, faces a maximum of six years in prison if convicted. You just never know what turns life might take. 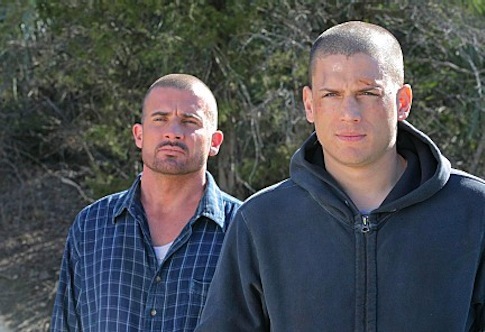 Maybe this season's Prison Break wasn't so convoluted after all. Nah. It was.